This month marks the 18th installment of T-SQL Tuesday. 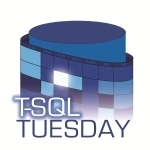 T-SQL Tuesday was started in December 2009 by Adam Machanic (blog | @AdamMachanic) and is defined as “a recurring, revolving blog party”. Any blogger wishing to participate is invited to write about the given topic, chosen by whoever is hosting that particular month. I’m very pleased to be hosting this time around for the T-SQL Tuesday taking place on May 10, 2011! – Your post must be published between 00:00 GMT Tuesday May 10, 2011, and 00:00 GMT Wednesday May 11, 2011. – Your post must contain the T-SQL Tuesday logo (see above) and the image must link back to this blog post. – Trackbacks should work, but if not please put a link to your post in the comments section so everyone can see your contribution! – Include “T-SQL Tuesday #18” in your blog post’s title. – Mention “coefficient of thermal expansion” in your post. – Tweet about your post and include the #tsql2sday hashtag. – Contact Adam Machanic and tell him you’d like to host! I’ll be reading through all the posts and publishing a summary shortly thereafter. I can’t wait to see what everyone has to say! Edit: I originally posted this a little too early and also with incorrect dates. Everything has now been corrected, and my apologies for any confusion. T-SQL Tuesday #18 – CTEs – The permission hierarchy problem – a look at solving a recursive permission definition problem with CTEs – http://www.atlantis-interactive.co.uk/blog/post/2011/05/10/T-SQL-Tuesday-18-CTEs-The-permission-hierarchy-problem.aspx – enjoy! This is great subject – it brought back all the memories when I was beginning with CTE. Thanks Pinal, glad you enjoyed it! Thanks for hosting! Here’s my contribution to T-SQL Tuesday. Hi Bob – my post looks at using CTE’s to aggregate data and return the top item within a group. It’s nothing particulary complicated, but is something that using sub queries had terrible performance on large datasets.